Join the quest to take back what love stole! 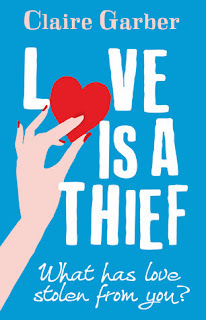 Kate Winters is an ordinary girl, with a not-so-ordinary mission: take back what love stole! Kate Winters might just be ‘that’ girl. You know the one. The girl who, for no particular reason, doesn’t get the guy, doesn’t have children, doesn’t get the romantic happy ever after. So she needs a plan. What does she like doing? What didn’t she get to do because she fell in love? What would she be happy spending the rest of her life doing if love never showed up again? Love is a Thief’s main character has a voice like I’ve never encountered before. I started this after a historical fiction novel so it was like stepping out of pea soup fog into a room full of neon signs. Kate is as vibrant as the people around her and I immediately found her hysterically funny. My worry is that I think Garber’s initial few chapters could have used a bit of tightening up as the different people were floating around without being very grounded or attached to Kate. I would have loved to have the characters concretely linked together from the get-go so I could enjoy all the funny and not have to remind myself who the people were. The thread of the novel got pulled too far away from Kate at times as there were a few too many people pursuing their own ambitions while leaving Kate's on the side-lines. While bumbling around helping others find their lost dreams, Kate also manages to start falling for her childhood friend, Peter. Conveniently enough he also seems to find her appealing but they’re both quite useless at getting this sorted out. It might come off as frustrating to some, but I enjoyed their hesitation (for the most part-sometimes I wanted to bang their heads together!) and actually found it realistic for people who’d known each other for so long. There are also some peculiar things from their past that slow down their getting together- but I won’t get into that! The concept of love having stolen your ambitions or your dreams is great and I really thought a lot about Garber’s intentions with that idea. Garber isn’t trying to put down love but open us up to remember things we’d wanted for ourselves. I love this and so should everyone else. Thank you to MIRA for our review copy. All opinions are our own.